Never leave a candle burning unattended, don't play with matches, yadda, yadda. 1. 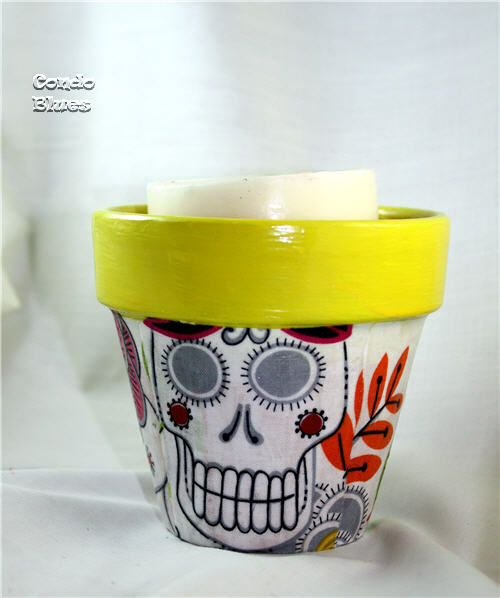 Paint the lip of the terra cotta flowerpot with paint that coordinates with your fabric and allow it to dry. 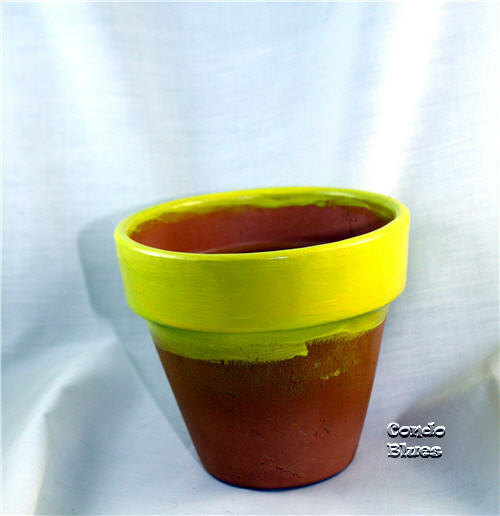 You don't need to paint the whole flowerpot. You will decorate the bottom part of the pot with fabric. 2. Place the sheet of paper on the side of the flower pot and trace the shape with the pencil to make a paper pattern. Cut the pattern from the paper with the scissors. 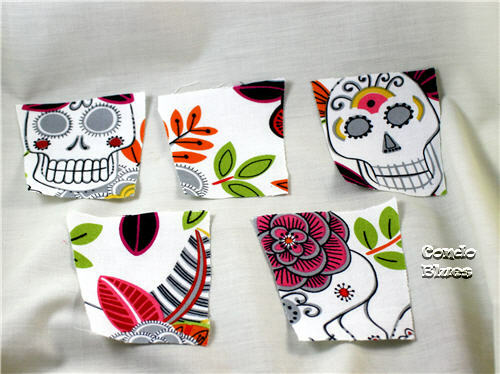 With the design on my fabric, I decided to make a series of panels in order to cut the sugar skulls from the fabric. Feel free to create a one piece wrap around pattern if it works better with the pattern on your fabric. 3. Pin the paper pattern onto the fabric with the straight pins and cut the pattern from the fabric out with the scissors. Remove the pins and paper pattern from the fabric. 4. 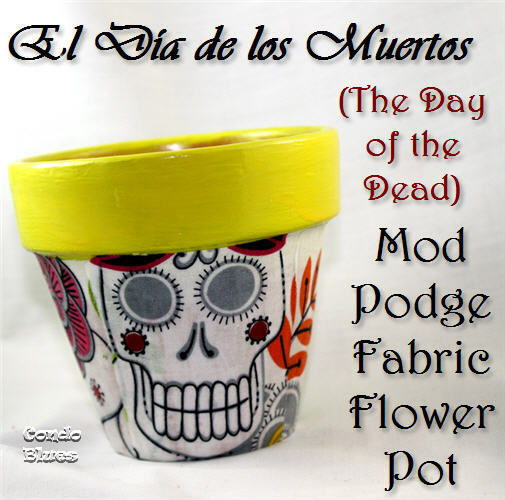 Use a paint brush and Mod Podge to glue the fabric to the flower pot. Allow the Mod Podge to dry overnight. Tip: I have separate brushes in my craft room designated for just paint and just Mod Podge since I am rubbish about thoroughly cleaning every bit of stuff from my paint brushes. 5. Use the paint brush to apply a top coat of Mod Podge to the fabric on the flower pot to seal it and allow it to dry overnight. 6. Fill up your flower pot and celebrate! 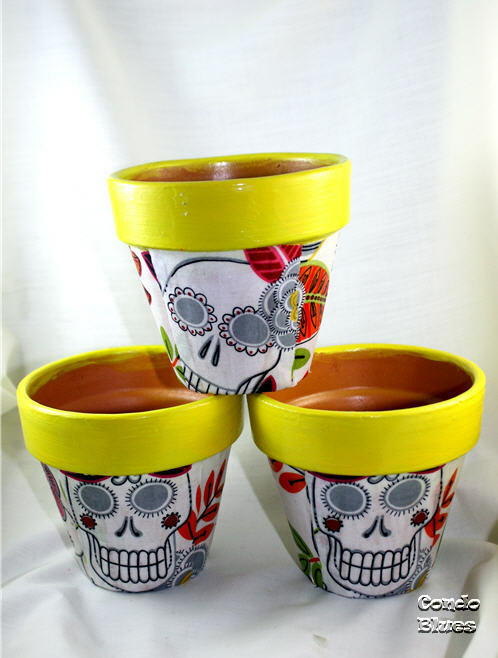 My friend loves her Día de los Muertos flower pot decorations. She filled them with pillar candles to make a festive centerpiece.